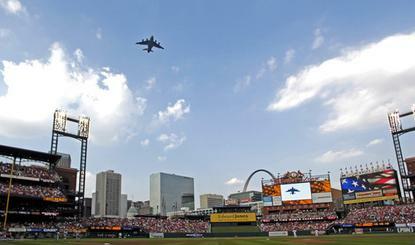 A C-17 Globemaster III flies over Busch Stadium in St. Louis before the Cardinals-Giants baseball game July 7, 2007. The flyover was part of Air Force Week St Louis. Even America's pastime isn't safe from cybercrime: the FBI is investigating allegations that the St. Louis Cardinals hacked into computer systems belonging to rival baseball team the Houston Astros. The investigation centers on the baseball operations database, which is said to contain statistics, video and other vital information about players. Count European consortium Airbus in on the business of delivering Internet service via satellites, the Verge reports. It's going to design and build 900 orbiters for Richard Branson's OneWeb, which aims to provide LTE, 3G, and Wi-Fi to rural communities. No, it's not a death knell for free speech in Europe, but the European Court of Human Rights nonetheless rattled some teacups when news broke Tuesday that it had ruled against an Estonian news site, holding it liable for hate-filled user comments. The ruling doesn't have immediate legal significance beyond the narrow confines of the case at hand, according to experts consulted by Ars Technica UK: it simply confirmed that Estonia's laws are not incompatible with the European Union's. The unbridled use of open-source components by both commercial and in-house business software developers could be leading to a proliferation of apps that are vulnerable to malware, says a company that manages one of the largest public repositories of Java components. And poor inventory practices mean that when there's a known flaw in a given component, developers won't be able to tell which of their apps use it, according to Sonatype. About 7.5 percent of components downloaded last year had known vulnerabilities. Two recently disclosed data breaches at the U.S. Office of Personnel Management could endanger national security and the lives of federal workers in intelligence or other sensitive jobs, according to some lawmakers. OPM officials said they are still investigating the breach of the security clearance database and declined to estimate how many people are affected or whether another government was responsible; they also declined to talk in a public hearing about whether intelligence or military workers were affected by the breach. SAP has rolled out new features in its Hana platform to help customers connect with IoT at enterprise scale and manage big data more effectively. One new feature enables organizations to synchronize data between the enterprise and remote locations at the edge of the network. Expanded data-integration capabilities in Hana will support the latest Hadoop distributions from Cloudera and Hortonworks. Now that net neutrality rules are in effect in the U.S., one company is wasting no time seeking to ensure that cable giant Time Warner starts playing by the rules, the Washington Post reports. Commercial Network Services says it will file a complaint with the Federal Communications Commission accusing the cable company of charging unreasonable rates to deliver its streaming videos to Time Warner's customers. Amazon on Wednesday will call on the U.S. Congress to embrace automated drone flights and come up with a set of simple, nationwide regulations that will allow its proposed Prime Air service to get off the ground. The rules proposed recently by the Federal Aviation Administration won't allow Prime Air to fly, so the head of its public policy team is heading over to testify before the U.S. House Committee on Oversight and Government Reform. Take three minutes and catch up with the E3 gaming expo happening in Los Angeles this week. Is the so-called sharing economy ruining our cities? Housing experts debate whether AirBNB is causing rising rents in San Francisco and New York.